With the three-year grant, the medical school plans to support up to 30 students as they complete their summer research and culminating capstone projects. 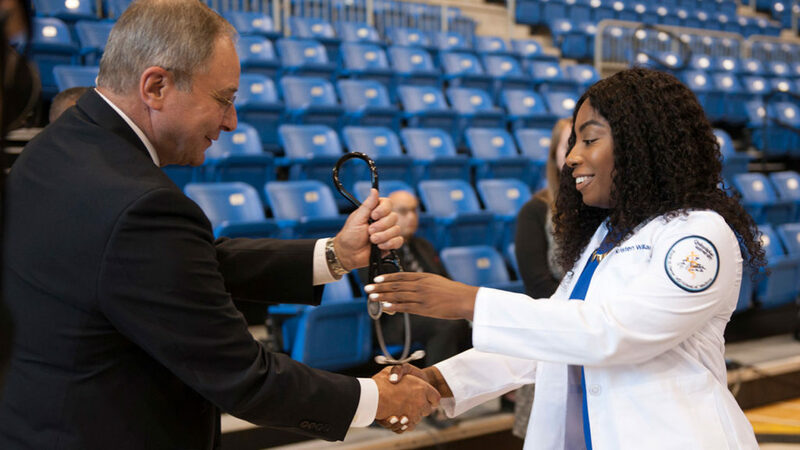 Dr. Bruce Koeppen, dean of the Frank H. Netter MD School of Medicine at Quinnipiac University, presents a stethoscope to first-year medical student Kristen Williams on Aug. 4, at the medical school’s annual White Coat ceremony. The Hearst Foundation has awarded the Frank H. Netter MD School of Medicine at Quinnipiac University a $100,000 grant to help medical students pursue their research projects and alleviate their debt. With the three-year grant, the medical school plans to support up to 30 students as they complete their summer research and culminating capstone projects. The funding also will be used to provide scholarships to up to 15 medical students who are pursuing careers as primary care physicians in the United States. Koeppen said being able to relieve debt is important for medical students because of the disparity in salaries between primary care physicians and specialists. According to the 2016 Medscape Physician Compensation Report, primary care physicians’ average annual salary is $207,000, which is less than specialists. For example, the annual salary of rheumatologists is $234,000; OB/GYNs, $277,000; and emergency medicine physicians, $322,000, according to the report. The Hearst Foundations are national philanthropic resources for organizations and institutions working in the fields of education, health, culture and social service. Its goal is to ensure that people of all backgrounds have the opportunity to build healthy, productive and inspiring lives.